Dance Motion USA was visiting Chiang Mai and an invitation from the local US Consul General got us to get out and about on Friday night. 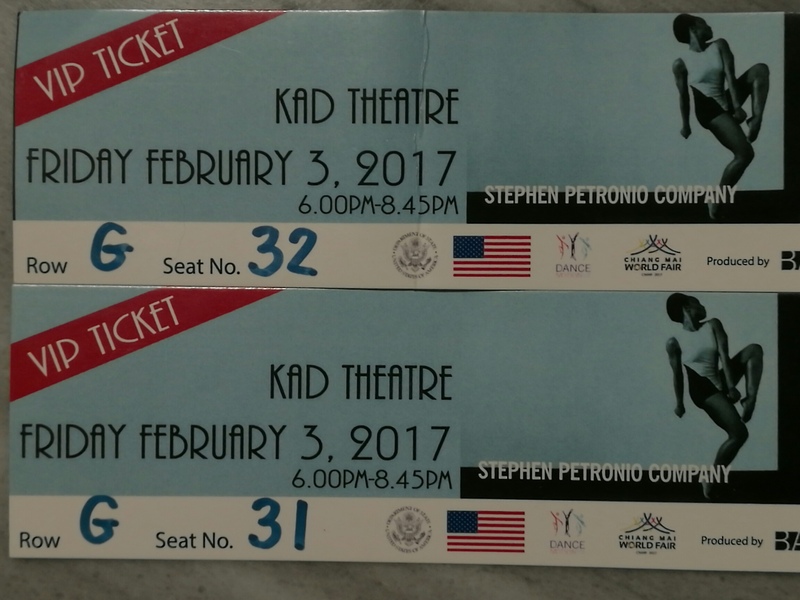 It had been a long week of activity so a night of social engagement was in order with the Stephen Petronio (dance) Company at Kad Theater(Kad Suan Kaew) in Chiang Mai. There was an opening ballet performance from the Chiang Mai ballet academy with a modern piece set to music written by the late King – a very enjoyable introduction. This was followed by a Lanna drum performance by a unique group from Lampoon. It was a very energetic and motivating performance. This was followed by a two part contemporary dance performing Locomotor/Non-Locomotor, a very different dance interpretation of body movements. The company from New York are touring through ASIA currently. They spent time in Chiang Mia to run workshops for some students and toured the sites. It was a pleasant night out, a great social get together ahead of the performance and chance to catch up with friends. The featured picture involves us with the US Deputy Head of mission, local US Consul General and local Chinese deputy Consul General.